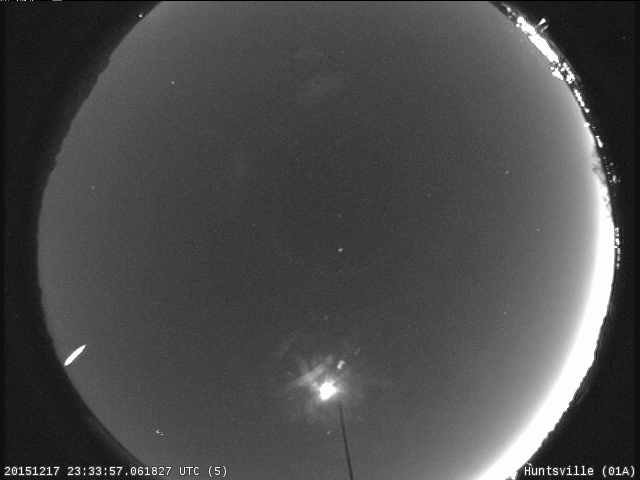 We have received numerous reports concerning a bright fireball that occurred over Georgia at 5:33:55 PM CST (6:33:55 PM EST). 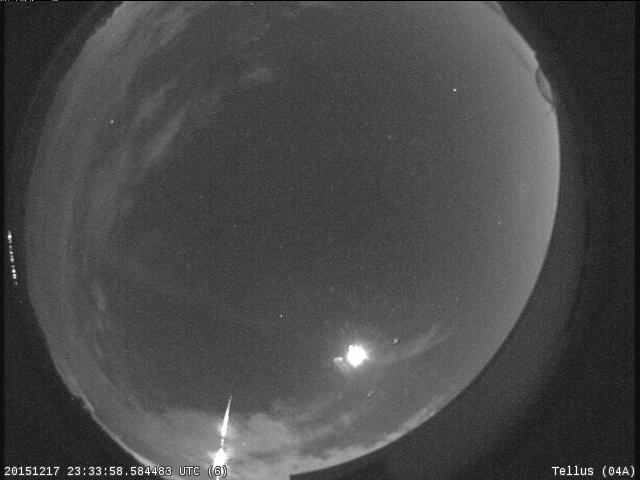 All 6 NASA all sky meteor cameras in the Southeast picked up the meteor at an altitude of 50 miles above the town of Georgia (SE of Atlanta). From its brightness, it is estimated that this piece of an asteroid weighed at least 150 pounds and was over 16 inches in diameter. 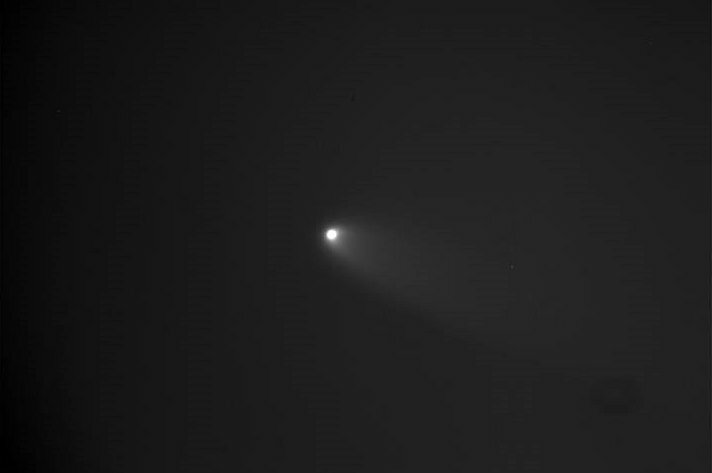 It entered the atmosphere at a steep angle and moved almost due south at a speed of 29,000 miles per hour. The NASA cameras tracked it to an altitude of 17 miles above the town of Locust Grove, where it had slowed to a speed of 9000 miles per hour, at which point the meteor ceased producing light by burning up. It is possible that fragments of this object survived to reach the ground as meteorites. A more detailed analysis will be performed tomorrow and further details will follow if this analysis still indicates the possibility of a meteorite fall. 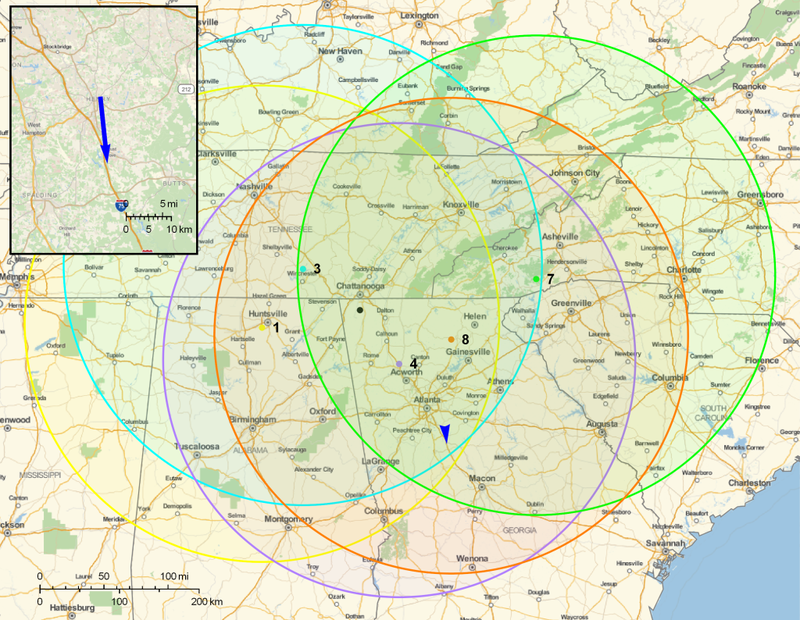 Ground track, still images from the cameras, and a movie from the NASA camera located in Cartersville, Georgia attached. 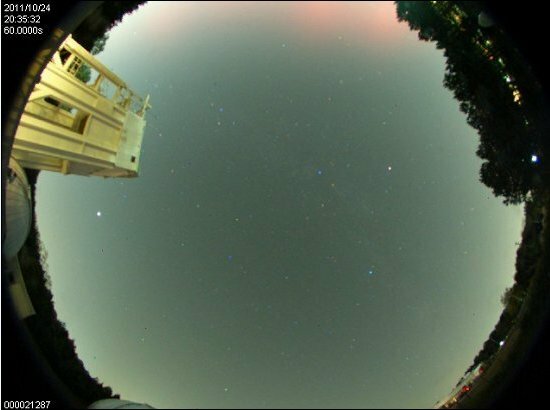 Images were taken by Rob Suggs and Aaron Kingery in twilight through cirrus clouds around 00:36 UT on 17 Mar 2013 with a 14 inch Schmidt-Cassegrain telescope at Marshall Space Flight Center’s Automated Lunar and Meteor Observatoryin Huntsville, Ala. The detector was a low-light level B&W video camera with a focal reducer giving a 20 arcminute horizontal field of view. The view shows the over-exposed coma and a faint division in the 2 sides of the dust tail. The images were not flat-fielded or dark-subtracted. The darker image is a stack of 60 video frames (2 seconds), enhanced to show the tail. The lighter image is produced by simply stacking 1600 video frames (53.3 seconds). On Oct. 24, 2011, the Northern Lights glowed over North Alabama, visible even though the skies were bright from city lights. Aurora Borealis, or Northern Lights, are unusual so far south — the colorful, 20-minute display was a rare sighting caused by a recent solar storm. 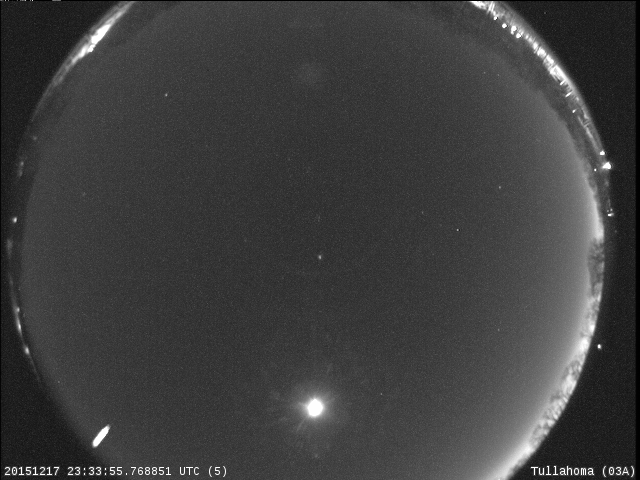 This video was captured by the color allsky camera at the Automated Lunar and Meteor Observatory, or ALaMO, at the Marshall Center in Huntsville, Ala.
A new color all-sky camera has opened its eyes at the ALaMO, or Automated Lunar and Meteor Observatory, at NASA’s Marshall Space Flight Center in Huntsville, Ala. Watch its inaugural video below, showing sunset fade into evening at the Marshall Center on Oct. 5, 2011. The time-lapse video spans about 2:28 hours, and the Moon is the object that emerges at the lower left side to cross the sky so brightly. The ALaMO consists of two observatory domes, a 15-meter, or 50-foot, tower with a roll-off roof and an operations center with laboratory space. A 14-inch Ritchey-Chrétien telescope resides in the tower, and a 14-inch Schmidt-Cassegrain in one of the two observation domes. Check out this curious short-term visitor, seen on Oct. 6, 2011.